Light Emitting Diodes (LEDs) in a display heavily influence its color, contrast, and NVIS radiance (NR) properties. White, green, and red LEDs with certain spectral emissions can be filtered with our PolyVision High Temperature Polymeric (HTP) filters to produce displays that comply with various NVIS color coordinates and NVIS Radiance (NR) specifications per MIL-STD-3009. Our PolyVision filters are designed specifically for MIL-SPEC and NVIS compliance of LEDs. 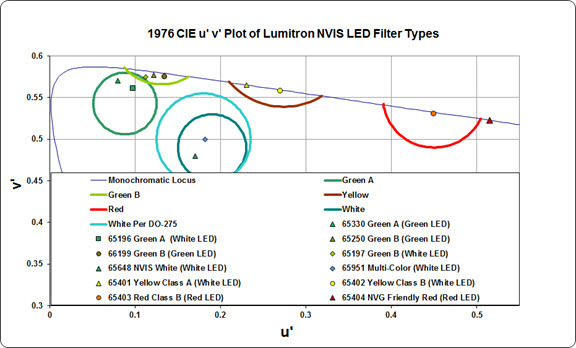 There are many advantages to filtering LEDs in a display, including reduced cost since the amount of filter material required to filter an LED is much less than what would be required to filter the front panel of the display. Our LED filters and LED filter assemblies can simplify production and reduce throughput. Many are available on tape and reel for automated installation.